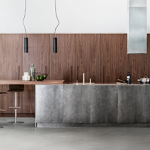 The interior design project is by the Stabili Architetti Studio and was entirely built by TM Italia. The same finishes and styling details were used in the living area, the bathroom and the sleeping quarters. The interiors of all the furniture are made of oak. 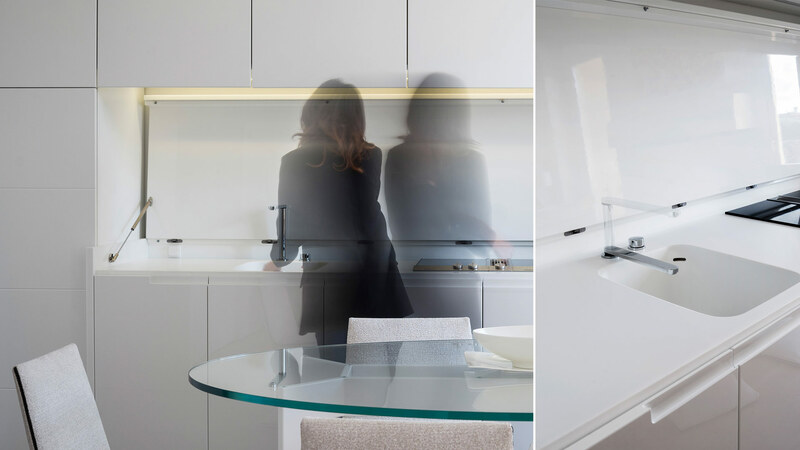 The kitchen fits perfectly into the living area and is an integral part of it, thanks to a mechanism that conceals the working and cooking area: the gloss white lacquered top has a folding opening and closing mechanism, lifted up by two gas springs that accompany its opening and slow down its closure. The top of the work area is made of Corian, as is the sink, which is welded inside. 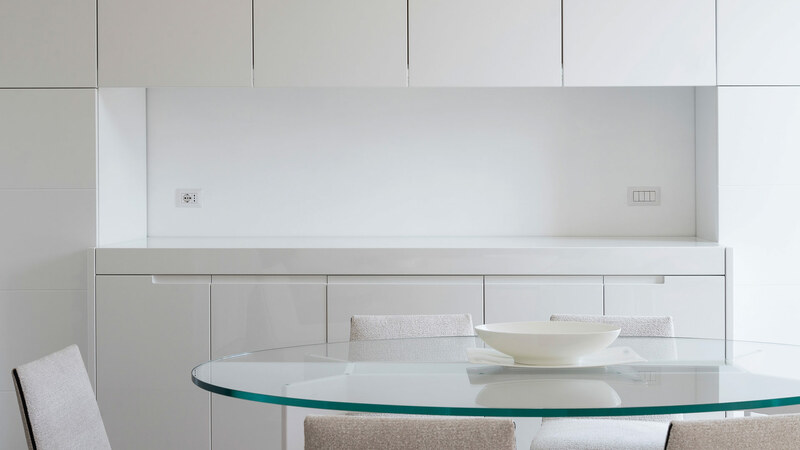 To enhance the harmony of design and shapes even further, the appliances have also been fully integrated into the units, including the oven, dishwasher and fridge. 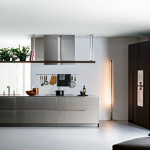 The hood, located between the two cooker units and fully incorporated inside the units, is also retractable. The basic style of the kitchen design project is based on concept G180. The build of the kitchen compensates the non-orthogonal walls. Indeed, the central unit that hosts the working area has asymmetrical protrusions which, together with the various trapezoidal-shaped units, see the composition embedded seamlessly into the architectural space. 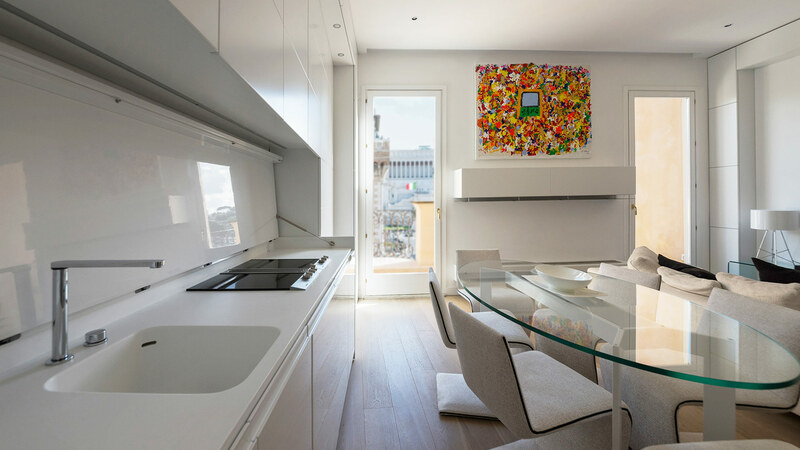 Between two windows overlooking Piazza Venezia, there is a suspended unit in the living area that houses a full-width bioethanol fireplace. Above it are two units with folding doors fitted with zinc-coated steel plates which absorb and radiate the heat produced by the fireplace. 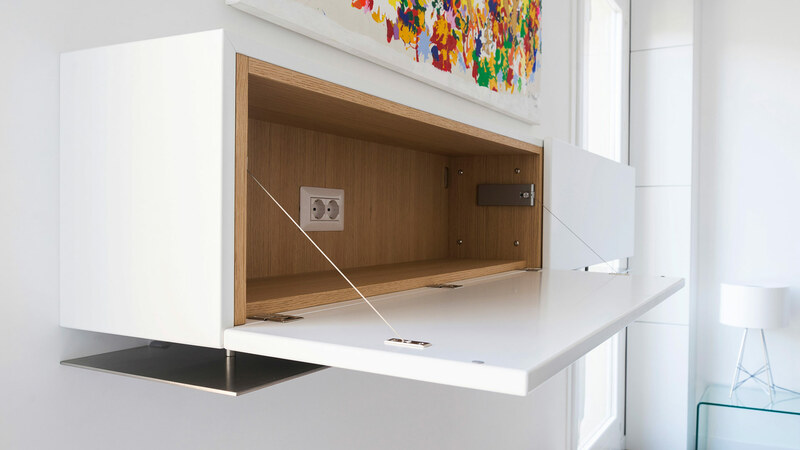 The suspended units also have a trapezoidal shape and are custom-made to realign and harmonise the architectural space. The entire furnishing project was built around a decorative unit with etched doors that provides a continuity of rhythm to the space. 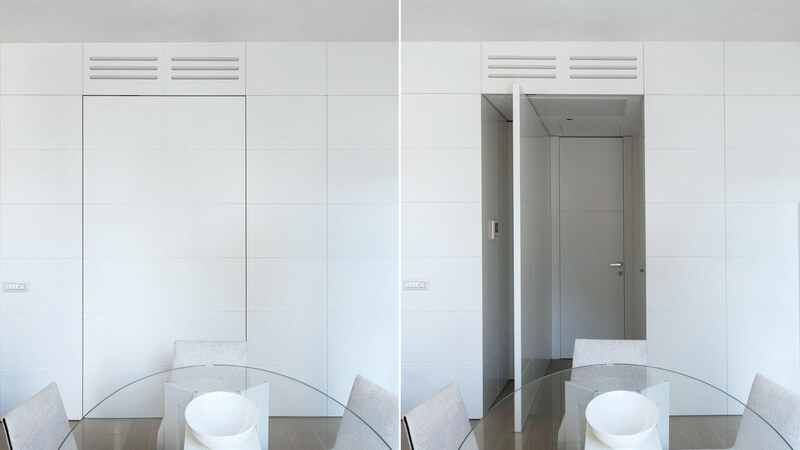 The wall opposite the kitchen is framed by trapezoidal units (sloping at the back) with doors measuring 80 cm for a total of four storage compartments that can be used as pantries. On the top part there are more units with folding doors and LED lighting. The wall continues with a coating that extends the continuity through to the entrance door, incorporated in a wall panel with the same fitting, the same finish and the same decorative unit as the rest of the furnishings. The entire wall is mounted on a cavity with orthogonal surfaces matching those of the walls. 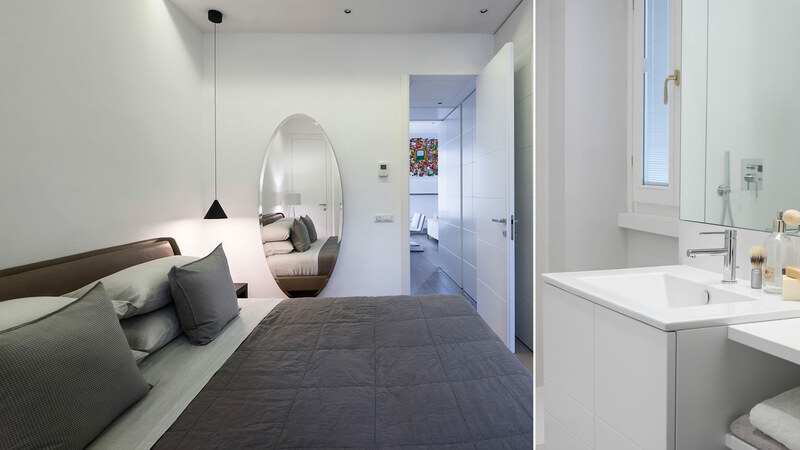 The wall also conceals a tilting door that leads to the sleeping quarters and the bathroom, operated by a hydraulic floor hinge which allows perfect alignment to surface once closed. The false ceiling in the hallway conceals a duct for the distribution of the air conditioning. The closet in the bedroom is based on concept D90 with push-and-pull door openings, oak interior and doors that continue the stylistic design trend of the entire project. All the doors are made by TM Italia using the same finish as the furnishings and customised sound-absorption solutions. The bathroom is based on concept D90, with push-and-pull doors and panels joined at 45°, while the internal structure is made of oak.